Body armor plates has advanced from hides and skins, to metal, to super strong synthetic fibers, to super strong synthetic hard materials. These new super strong hard materials are called ceramics. Ceramics are some of the hardest materials known to man. Unlike materials like Kevlar which uses its fibers to “catch” the bullet, ceramics are so hard they break the projectile. The strongest ceramic armor plates are made of boron carbide. The ceramic armor plates are made by compressing and baking the boron carbide powder in a kiln at 4000 degrees Fahrenheit. 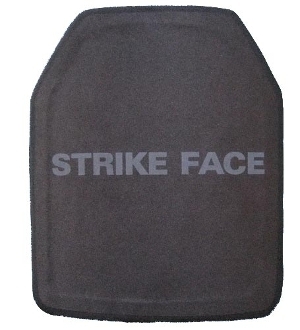 The plates are then used in conjunction (or stand alone) with bulletproof vests to defend against high powered rifle rounds and dangerous weapons ballistics and fragmentation. So with all these obvious benefits of ceramic body armor, you’re probably wondering what the downfalls are. Well the biggest downfall of ceramic body armor is both a good thing and a bad thing. When a ceramic body armor plate is hit by a projectile it cracks and splinters so each subsequent hit weakens the armor plate more. The bad is fairly obvious, soldiers probably aren’t carrying extra ceramic armor plates around, if they take a lot of hits in the same area. There has been a lot of research into how to minimize this effect. Elastic materials, shrinking the bullet proof plates and even making the ceramic armor plates out of small ceramic pebbles and fireproof glue have been some methods. The good might not be as obvious but it’s very beneficial. Because the ceramic armor plates cracks, it dissipates the force of the projectile without injuring the soldier. Ceramic body armor inserts for bulletproof vests aren’t the only uses that have been found for ceramic armor plates either. Since ceramic body armor is so strong, up to 5 times stronger than steel (initial impact) and also up to 70% lighter, more and more potential is emerging from ceramics. Advancements are happening every day, just recently some scientists are claiming they can make ceramic armor plates even stronger with the help of nanotechnology. Who knows what will be developed next?